Hampton Inn by Hilton Boulder/ Louisville welcomes fans attending the Excision with Figure and Bear Grillz show on Saturday, March 26th, to continue their night and stay at Hampton after the show. Fans can expect a show like no other, with twisting and morphing sounds turning massive crowds into frenzy. The show begins at 7 pm with ticket prices ranging from $10 to $50. Day of show ticket prices will increase to $30 to $70, so fans are encouraged to purchase tickets at http://www.1stbankcenter.com. A short ten-minute drive from the 1st Bank Center in Broomfield, Hampton Inn by Hilton Boulder Louisville welcomes all Excision fans to stay the night after the show and enjoy Hampton’s amazing amenities. Hampton offers guests free Wi-Fi, complimentary hot breakfast buffet daily, indoor pool, fitness center and much more. Guests may choose from king, double queen, king study and accessible rooms, available upon request. 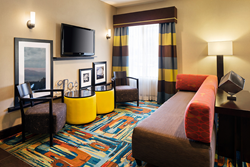 Hampton offers great amenities, comfortable rooms and group accommodations. Guests will enjoy the hotel’s close location to Boulder Valley Ice, Pearl Street Mall, Flatirons Crossing Mall, University of Colorado at Boulder and much more.